Capture life to the full with the Gear 360 (2017). The redesigned, easy-to-grip body makes it easy to record or broadcast live video in stunning 4K, or take vivid 15-megapixel photos. Either way 360-degree vision is all yours. The spherical shape and dual cameras of the Gear 360 (2017) mean you can capture the whole world around you. Broadcast 360° views on your social platforms in glorious 4K. 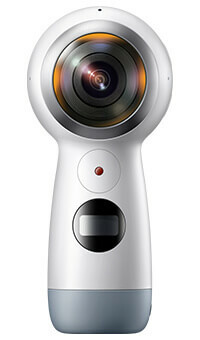 The Samsung Gear 360 makes it easy to capture a 360-degree view of the world in high-definition. Capture the action in crystal-clear 4K video or shoot amazing 360-degree photos with the twin 13-megapixel cameras. It’s fully compatible with the Samsung Gear VR – so you can re-live your adventures or share them with loved ones at your leisure. And it’s easy to convert your 360 content into standard video or photo format to upload and share to wherever your audience is. You can broadcast live, in full 4K video and a 360-degree view. Simply pair your Samsung Gear 360 (2017) with your Samsung S8 (or other Android device), choose a social media platform that supports live streaming and give your friends a real-time view of what’s happening in your life. Download the Samsung Gear 360 app to your tablet or smartphone and you can easily create and share brilliant and unique high-resolution images. Simply choose one of the five modes – 360-degree view, Stretched view, Round view, Dual view or Panoramic view – then save and you’re ready to share. You can easily edit, zoom and crop in the app too, giving you even greater control. The improved battery life of the Samsung Gear 360 (2017) means you can record for up to 130 minutes of video. And with an SD card slot that supports 256GB memory, there’s plenty of space to store your 360-degree memories. The redesigned handle makes the Gear 360 (2017) easy to hold, and acts as a stand too. You can even connect it to a tripod for truly professional results. It’s the perfect partner for the Samsung Gear VR and a must-have accessory for every gadget fan and photography enthusiast.